Modified designs of the definitive Austrian Empire stamp types of 1899 to 1901 were issued during the period from 1904 to 1907. The stamp paper with diagonal varnish bars was used for the first issues of 1904, but in 1905, it was abandoned in favor of regular printing paper without the varnish coating. All of the Austrian Imperial definitive postage stamps of this period feature the left-facing portrait of Emperor Franz Josef I. 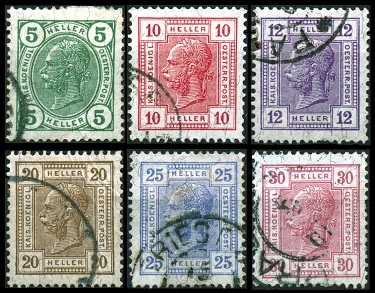 The fourteen major-type Austrian Empire definitive stamps shown above were issued between 1904 and 1905. They are printed on unwatermarked, granite paper, with or without varnish bars, and they were produced with two different perforation gauges. These new Austrian Empire stamps have modified corner numerals, making them different from the previous issues, as follows. 01 H. - 06 H. - Colored numerals on a white background. 10 H. - 30 H. - Black numerals on a white background. 35 H. - 72 H. - White numerals on a colored background. 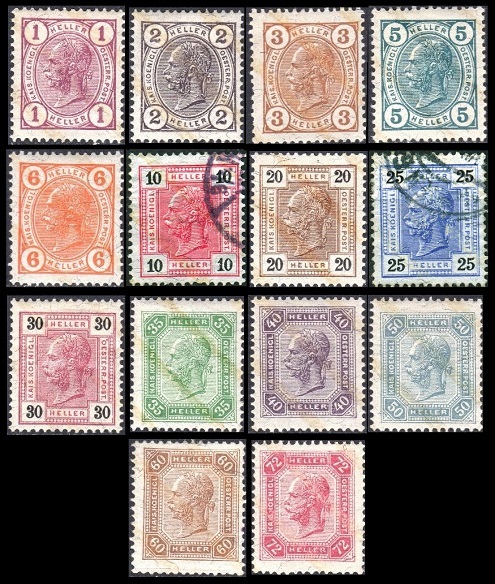 The Michel / Scott catalog attributes, for Austrian Empire stamps that are printed on paper WITH diagonal varnish bars and that are perforated 13 x 12 1/2, are as follows. The colors used in the table are from the Michel catalog. 01 H. (1904 - Mi. #105A, Sc. #86b) - Dark Gray Lilac. 02 H. (1904 - Mi. #106A, Sc. #87b) - Red Black. 03 H. (1904 - Mi. #107A, Sc. #88b) - Dark Yellow Brown. 05 H. (1904 - Mi. #108A, Sc. #89b) - Dark Bluish Green. 06 H. (1904 - Mi. #109A, Sc. #91b) - Dark Orange. 10 H. (1904 - Mi. #110A, Sc. #97b) - Lilac Red. 20 H. (1904 - Mi. #111A, Sc. #98b) - Dark Ocher Brown. 25 H. (1904 - Mi. #112A, Sc. #99b) - Violet Ultramarine. 30 H. (1904 - Mi. #113A, Sc. #100b) - Brownish Lilac. 35 H. (1904 - Mi. #114A, Sc. #101b) - Opal Green. 40 H. (1904 - Mi. #115A, Sc. #102b) - Dark Violet Brown. 50 H. (1904 - Mi. #116A, Sc. #103b) - Medium Prussian Blue. 60 H. (1904 - Mi. #117A, Sc. #104b) - Yellow Brown. The Michel / Scott catalog attributes, for stamps that are printed on paper WITH diagonal varnish bars and that are perforated 13 x 13 1/2, are as follows. 01 H. (1904 - Mi. #105C, Sc. #86a) - Dark Gray Lilac. 02 H. (1904 - Mi. #106C, Sc. #87a) - Red Black. 03 H. (1904 - Mi. #107C, Sc. #88a) - Dark Yellow Brown. 05 H. (1904 - Mi. #108C, Sc. #89a) - Dark Bluish Green. 06 H. (1904 - Mi. #109C, Sc. #91a) - Dark Orange. 10 H. (1904 - Mi. #110C, Sc. #97a) - Lilac Red. 20 H. (1904 - Mi. #111C, Sc. #98a) - Dark Ocher Brown. 25 H. (1904 - Mi. #112C, Sc. #99a) - Violet Ultramarine. 30 H. (1904 - Mi. #113C, Sc. #100a) - Brownish Lilac. 35 H. (1904 - Mi. #114C, Sc. #101a) - Opal Green. 40 H. (1904 - Mi. #115C, Sc. #102a) - Dark Violet Brown. 50 H. (1904 - Mi. #116C, Sc. #103a) - Medium Prussian Blue. 60 H. (1904 - Mi. #117C, Sc. #104a) - Yellow Brown. 72 H. (1904 - Mi. #118C, Sc. #105a) - Carmine. The Michel / Scott catalog attributes, for stamps that are printed on paper WITHOUT diagonal varnish bars and that are perforated 13 x 12 1/2, are as follows. 01 H. (1905 - Mi. #119A, Sc. #86) - Dark Gray Lilac. 02 H. (1905 - Mi. #120A, Sc. #87) - Red Black. 03 H. (1905 - Mi. #121A, Sc. #88) - Dark Yellow Brown. 05 H. (1905 - Mi. #122A, Sc. #89) - Dark Bluish Green. 06 H. (1905 - Mi. #123A, Sc. #91) - Dark Orange. 10 H. (1905 - Mi. #124A, Sc. #97) - Lilac Red. 20 H. (1905 - Mi. #125A, Sc. #98) - Dark Ocher Brown. 25 H. (1905 - Mi. #126A, Sc. #99) - Violet Ultramarine. 30 H. (1905 - Mi. #127A, Sc. #100) - Brownish Lilac. 35 H. (1905 - Mi. #128A, Sc. #101) - Opal Green. 40 H. (1905 - Mi. #129A, Sc. #102) - Dark Violet Brown. 50 H. (1905 - Mi. #130A, Sc. #103) - Medium Prussian Blue. 60 H. (1905 - Mi. #131A, Sc. #104) - Yellow Brown. 72 H. (1905 - Mi. #132A, Sc. #105) - Carmine. The Michel / Scott catalog attributes, for stamps that are printed on paper WITHOUT diagonal varnish bars and that are perforated 13 x 13 1/2, are as follows. 02 H. (1905 - Mi. #120C, Sc. #87) - Red Black. 03 H. (1905 - Mi. #121C, Sc. #88) - Dark Yellow Brown. 05 H. (1905 - Mi. #122C, Sc. #89) - Dark Bluish Green. 06 H. (1905 - Mi. #123C, Sc. #91) - Dark Orange. 10 H. (1905 - Mi. #124C, Sc. #97) - Lilac Red. 20 H. (1905 - Mi. #125C, Sc. #98) - Dark Ocher Brown. 25 H. (1905 - Mi. #126C, Sc. #99) - Violet Ultramarine. 30 H. (1905 - Mi. #127C, Sc. #100) - Brownish Lilac. 35 H. (1905 - Mi. #128C, Sc. #101) - Opal Green. 50 H. (1905 - Mi. #130C, Sc. #103) - Medium Prussian Blue. 60 H. (1905 - Mi. #131C, Sc. #104) - Yellow Brown. The six new Austrian Empire definitive stamps shown above were issued in 1906 and 1907. They are printed on unwatermarked, granite paper, and they are all perforated 13 x 12 1/2. All of these new Austrian Empire stamps feature colored numerals on a white background. The Michel / Scott catalog attributes are as follows. The colors used in the table are from the Michel catalog. 05 H. (1906 - Mi. #133, Sc. #90) - Dark Green. 10 H. (1906 - Mi. #134, Sc. #92) - Carmine Red. 12 H. (1907 - Mi. #135, Sc. #93) - Dark Violet. 20 H. (1906 - Mi. #136, Sc. #94) - Dark Ocher Brown. 25 H. (1906 - Mi. #137, Sc. #95) - Medium Violet Ultramarine. 30 H. (1906 - Mi. #138, Sc. #96) - Dark Red Lilac.